Salisbury steak is a dish made from a blend of minced beef and other ingredients, which is shaped to resemble a steak, and usually is served in brown sauce. Hamburger steak is a similar product, but differs in ingredients. 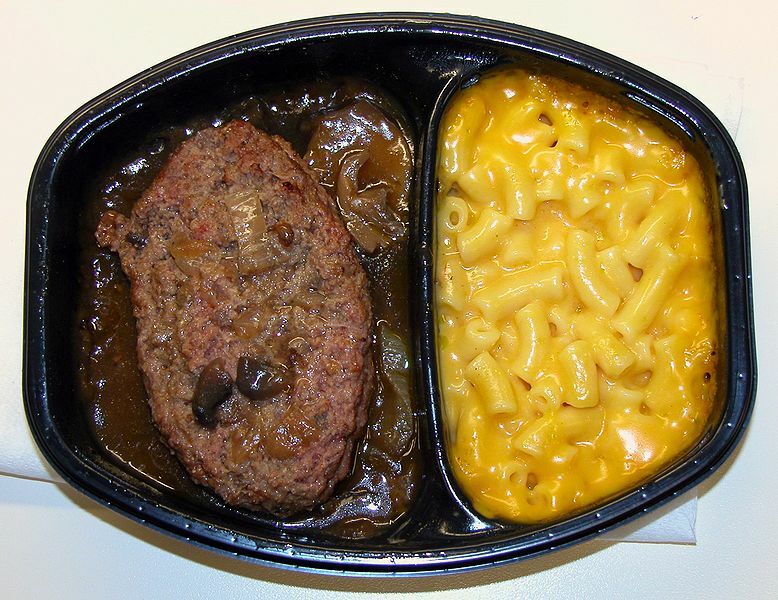 Left: A "TV dinner" of salisbury steak and macaroni and cheese. Salisbury steak was invented by an American physician, Dr. J. H. Salisbury (1823–1905), and the term "Salisbury steak" was in use in the USA from 1897. It is popular in the United States, where it is traditionally served with gravy and mashed potatoes or noodles. The USDA standards for Salisbury steak require a minimum content of 65% meat, of which up to 25% can be pork; the remainder must be beef (can include beef heart meat), unless the meat content is labelled specifically. Cereal (bread crumbs, flour, oat flakes, etc.) content is limited to 12%, except isolated soy protein at 6.8% is considered equivalent to 12%. The remainder consists of seasonings, vegetables (onion, bell pepper, mushroom or the like), binders (can include egg) and liquids (such as water, milk, cream, skim milk, etc.). The product must be fully cooked, or else labelled "Patties for Salisbury Steak". The standards for hamburger limit the meat to beef only, and of skeletal origin only. Salt, seasonings and vegetables in condimental proportions can be used, but liquids, binders and/or extenders preclude the use of the term "hamburger" or "burger". With these added, the product is considered "beef patties". Hamburg is a popular Salisbury steak dish in Japan. It is made from ground meat with finely chopped onion, egg and breadcrumbs flavored with various spices and made into a flat circular shape about a centimeter thick and 10 to 15 cm in diameter. Many restaurants specialize in various styles of hamburger. In Japan, the dish dates back to the Meiji period and is believed to have been first served in Yokohama, which was one of the first ports opened to foreigners. Since the 1980s, vacuum packed hamburgers were sold with sauce already added, and these are widely used in box lunches (bento). Frozen hamburgers are popular as well, often served in fast food style restaurants because they have a richer taste and firmer texture than vacuum-packed hamburger. 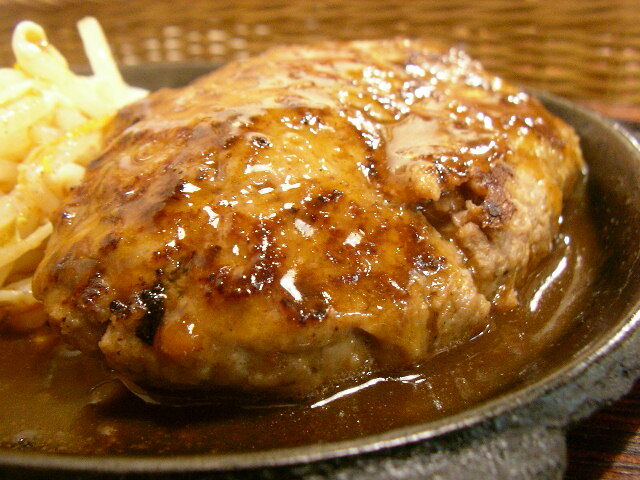 In Hawaii, hamburger steak is very similar to the Japanese Hamburg steak. It consists of burger patty with brown gravy. It is usually served with macaroni salad and rice in a plate lunch. There is also a variety which includes an egg, which is called loco moco.